It's lunchtime here in Central Florida, and I am still awaiting the arrival of Tropical Storm Fay. So far, not much rain has fallen and the winds are relatively calm. The local news people are telling me that we still start to feel the effects within a few hours. Oh joy. I got up early today and completed phase two of my master cleaning plan. I cleaned all three bathrooms. Tomorrow is the bedroom. Although now I have a ton of laundry piled up. Perhaps I need to start working on that today, since it's still relatively early and my hands are idle. For the last three weekends in a row, my good friend Danielle has had garage sales. Last night, around 9 p.m. or so, I got the cleaning bug and hauled out a bunch of stuff for a garage sale. Danielle said she's going to have another one this Saturday. Tropical Storm Fay is headed our way, probably hitting Central Florida tomorrow mid-morning. I've been pretty lazy about housework lately. I'm at the point where is it too much to try to take care of in one morning. Therefore, in a sign of my ongoing maturity, I have decided to tackle one room a day. In this way, I get the house clean within the week under manageable conditions. Today, the first day, I took on the kitchen. I cleaned out the refrigerator and freezer. I stockpiled ice (for the storm). Also, the shelves and pantry are organized. The stove and microwave got a thorough cleaning. I even put stuff aside for my friend's garage sale at the end of the week. Finally, I got on my hands and knees and cleaned the floor. Whew! I love a clean kitchen; although the rest of the house is unkempt, my kitchen gives me hope. I've been knitting since Memorial Day weekend, which is about 3 months. I love knitting. It's the one hobby (other than reading) that I'm serious about and I haven't given up before I ever really started (Example: Piano lessons - which, by the way, I still have all my books, notes from the four or so lessons I took, and the Casio keyboard I bought. I keep hoping I will go back to it one day. Sure......just like I'm going to lose this weight). Back to knitting. I feel invested with this hobby but practical in the same vein. I have not bought a ton of yarn (partly due to me being out of work but also because I'm not good enough to buy the expensive yarn). I'm really a novice. Especially when I peruse the knitting blogs and forums out there. I'm into my second (and last) week of babysitting. I've settled into a routine with the 2-year old. She's still unhappy to see me on certain occasions (I can't hold it against her). After this assignment, I have to start focusing on finding regular employment. I miss regular work, and the freedom that a paycheck brings you. It doesn't have to be a big paycheck, after all, there are no kids and no husband in my life. It's just me and a few bills. I'm slowly working on my knitting. Funny thing is that once you learn one skill, you have to learn four other skills to finish a piece. I'm so backwards at blocking and seaming. I think I need to find a group of knitters in my area to sit down with and learn and watch. 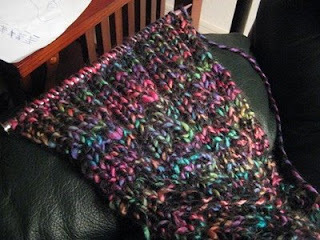 This is the reversible cable scarf that I am knitting. I got the free pattern from this site. However, my choice of yarn doesn't show the cables very nicely. My scarf is going to end up being very thick. I really like the colors in this yarn (it's Acrylic/Alpaca blend). I enjoy knitting this pattern - it's very easy to do (I can even do it while babysitting). I think I've got the hang of cables now. I plan to try to do more cable designs. They just look so nice and like you put a bunch of work into it (when really it's quite simple to do). For my second project, I'm working on a sweater. The pattern is from a book I bought, Knitting Simple Sweaters From Luxurious Yarns. And no, I didn't use a luxurious yarn....I used a wool yarn that was on sale at Michael's. So I've been out of work for over three weeks now. I'm babysitting for the next two weeks (so I consider this work - hell, I'm getting paid for it and it gets me out of the house so it's work!!!). Unfortunately for me, I entertained an offer to go back to my old job. This is how it went down....they called me and asked me (twice!!) to come back. So I made an appointment to go in for an interview. (Now, at this point, I'm a little miffed that I have to "interview" but I can play the game....) During the interview, they offered me considerably less than what I was making before to come back. I turned them down. Perhaps not the wisest decision financially but I was extremely disappointed by this turn of events. I felt that I put myself out to be humiliated by them. First, I agreed to an interview and then I had to sit there and listen to them try to sell me on a much lower salary.